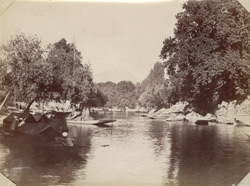 Photograph of the Chenar Bagh on the Dal Canal at Srinagar, in Jammu and Kashmir, taken in the 1860s, from the Edward Molyneux Collection: Album entitled 'Indian Photographs'. This view looks along the canal, lined with local boats, towards Takht-i-Sulaiman hill, which can be seen very faintly in the distance. Chenar, or Chinar, the Persian name for the Oriental Plane Tree (Platanus Orientalis Kashmiriana) refers to the colour of its leaves in autumn, which change from golden yellow to red. The chenar is often planted along river banks and is seen here in a bagh, or garden, on the banks of Dal Lake. This lake is the largest in Srinagar and is renowned for its intricately decorated and well furnished houseboats and Shikara boats which are used for transporting goods and people on the lake and also as floating shops.